Your colleagues as force for change. Lessons from psychology. 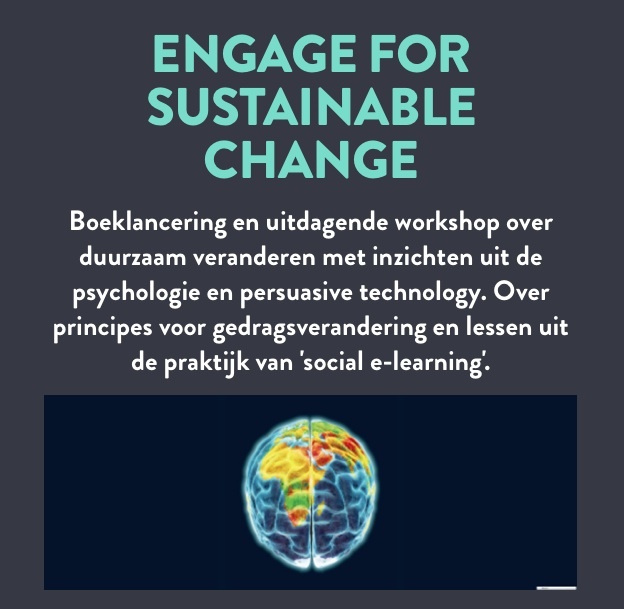 Book release and challenging workshop about sustainable change with insights from psychology and persuasive technology. About principles of behaviour change and lessons from the field of ‘social e-learning’. Do you want to mobilise your colleagues as a force for change? Do you work for a large organisation? Two slots left -> workshop 25 March. About sustainable change using insights from psychology and persuasive technology. About behaviour change principles and lessons from the field of ‘social e-learning’. * How do you involve employees as a force for change in these difficult times? * How do you get large groups of employees on board in your movement for sustainability? * And in such a way they will come to like the change? Sign up and more info: http://checkthis.com/7p5d (in Dutch). The 25 March workshop is full, we are considering additional dates later this year.